Chris McClatchey is a nationally recognized speaker & coach. 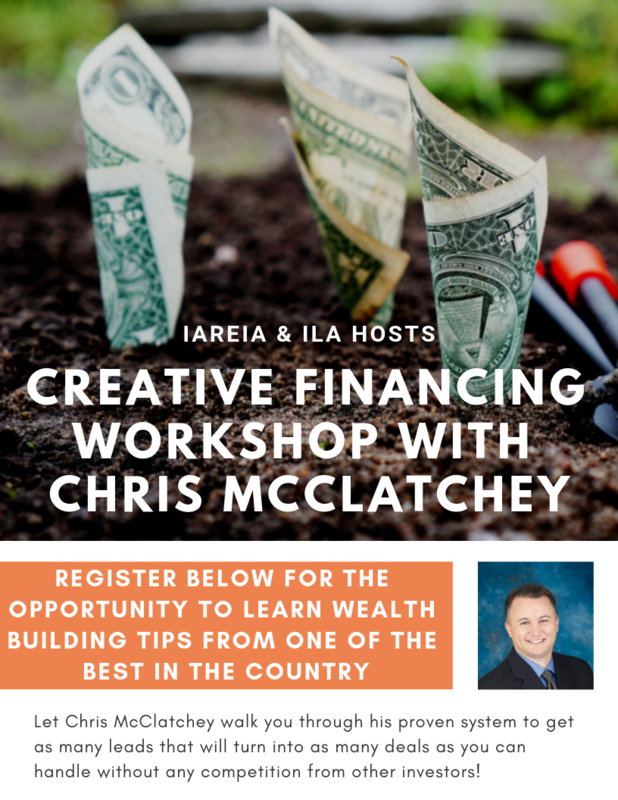 Chris teaches individuals from beginning investors to seasoned professionals, how to build and maintain real wealth through the use of real estate investments. Receive $10 in REIA Bucks for subscribing to our YouTube channel AND another $10 in REIA bucks for joining our Facebook group. Apply that to your registration or save it for a future event! Use the links below to join and subscribe. We've been wanting to attract Chris to Des Moines, to IOWA (where he has never been), for several years. Chris is continually ranked as top notch with content and value by top-ranked REIA group leaders from Phoenix to D.C., and Seattle to Miami. Alan Langston, leader of the largest REIA in the country, likes Chris McClatchey so much he brings him back over and over again -- because his members love learning his techniques to supercharge their investing biz! Real Estate investing is supposed to lead to extra cash, provide you with extra time and create massive amounts of wealth to free you from the financial pressures of everyday life. The challenge is you don’t have any leads…. you’re not doing any deals… and you’re frustrated with all of the competition from other investors. Let Chris McClatchey walk you through his proven system to get as many leads that will turn into as many deals as you can handle without any competition from other investors! -How you will find leads other investors can’t. -How you can put thousands of dollars in your pocket at closing. -The strategies that will get you properties FREE & CLEAR in a few years. -How you can communicate with seller’s so they give you seller financing. -The skills you need to influence sellers to sell their property to you at 0% interest. -How you can double and triple the number of deals you are doing now.